Piso Fare Promos: Don't you know that Cebu Pacific will have new local flights to and from VisMin cities? Around 5 new domestic flights are said to take off on July 26, 2017. These new flights are the following: Cebu and Masbate, Davao and Dumaguete, and Zamboanga and Cotabato (Monday, Wednesday and Friday), Cagayan de Oro and Zamboanga, & Davao and Tacloban (Tuesday, Thursday, and Saturday). That's like trips scheduled like three time a week! So don't forget to plot your flight schedules. You might want to consult your desk calendar for that matter. So what's the cheapest plane ticket whole year round that you can book via CebuPacific? 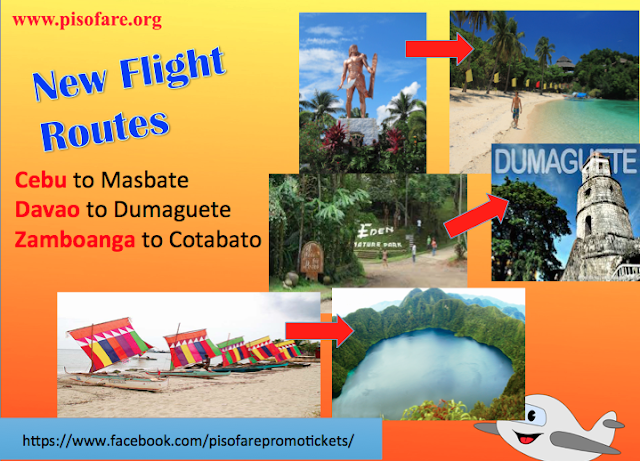 Cebu to Masbate will cost you only P1758. Followed by Zamboanga to Cotabato at P1806. The next cheaper fare is from Cagayan de Oro to Zamboanga at P1906. However, Davao to Tacloban will be around P 2142 and Davao to Dumaguete is P2590. Please be guided with these plane ticket fares and the scheduled mentioned above. Of course, Cebu Pacific continues to provide affordable plane fares to their local flights and in their other stations located in Manila, Clark, Iloilo and Kalibo. CEB enhances inter-island connectivity within the country and across the globe with its 66 destinations with over 100 routes, spanning Asia, Australia, the Middle East, and USA. Again, when you travel take note of the dos and don'ts on what to bring. It is important to always bring along with you your ID when to traveling always specially if you're bound to areas in Mindanao. Traveling to the Philippines is generally safe so have fun and always be cautious at all times. As of the moment, no Piso Fare promos yet. How is Php 799 Promo for you?